Rau M, Stickel F, Russmann S, Manser CN, Becker PP, Weisskopf M, Schmitt J, Dill MT, Dufour JF, Moradpour D, Semela D, Müllhaupt B, Geier A; Swiss Hepatitis C Cohort Study Group (SCCS). Background & Aims: In the last decade pegylated interferon-α (Peg-INF-α) plus ribavirin (RBV) was the standard treatment of chronic hepatitis C for genotype 1, and it remains the standard for genotypes 2 and 3. Recent studies reported associations between RBV-induced anemia and genetic polymorphisms of concentrative nucleoside transporters such as CNT3 (encoded by SLC28A3) and inosine triphosphatase (encoded by ITPA). We aimed to study genetic determinants of RBV kinetics, efficacy and treatment associated anemia. Methods: We included 216 patients from two Swiss study cohorts (61% HCV genotype 1, 39% genotypes 2 or 3). Patients were analyzed for SLC28A2 single nucleotide polymorphism (SNP) rs11854484, SLC28A3 rs56350726 and SLC28A3 rs10868138 as well as ITPA SNPs rs1127354 and rs7270101 and followed regarding treatment-associated hemoglobin changes and sustained virological response (SVR). In 67 patients RBV serum levels were additionally measured during treatment. Results: Patients with SLC28A2 rs11854484 genotype TT had higher dosage- and body weight-adjusted RBV levels than those with genotypes TC or CC (p=0.02 and p=0.06 at weeks 4 and 8, respectively). ITPA SNP rs1127354 was associated with hemoglobin drop ≥ 3 g/dl during treatment in genotype (relative risk (RR)=2.1, 95%CI 1.3-3.5) as well as in allelic analyses (RR=2.0, 95%CI 1.2-3.4). SLC28A3 rs56350726 was associated with SVR in genotype (RR=2.2; 95% CI 1.1-4.3) as well as in allelic analyses (RR=2.0, 95% CI 1.1-3.4). 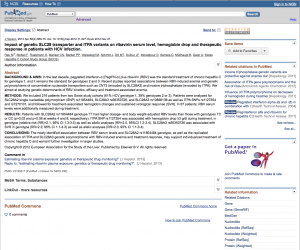 Conclusions: The newly identified association between RBV serum levels and SLC28A2 rs11854484 genotype as well as the replicated association of ITPA and SLC28A3 genetic polymorphisms with RBV induced anemia and treatment response may support individualized treatment of chronic hepatitis C and warrant further investigation in larger studies.